Szechuan peppercorn is one of the go-to spices in most Chinese cuisine. It is most known for the numbing sensation it creates around one’s mouth. When it is paired with chili peppers, most chefs believe the numbing effects help to reduce the heat that comes from them, which then allows guest to appreciate the intense, fruity flavor that they provide. This particular “pepper” belongs in the rue of the citrus family, but despite its name, has no relation to black pepper or chili pepper. It is a type of pepper in a class all by itself. 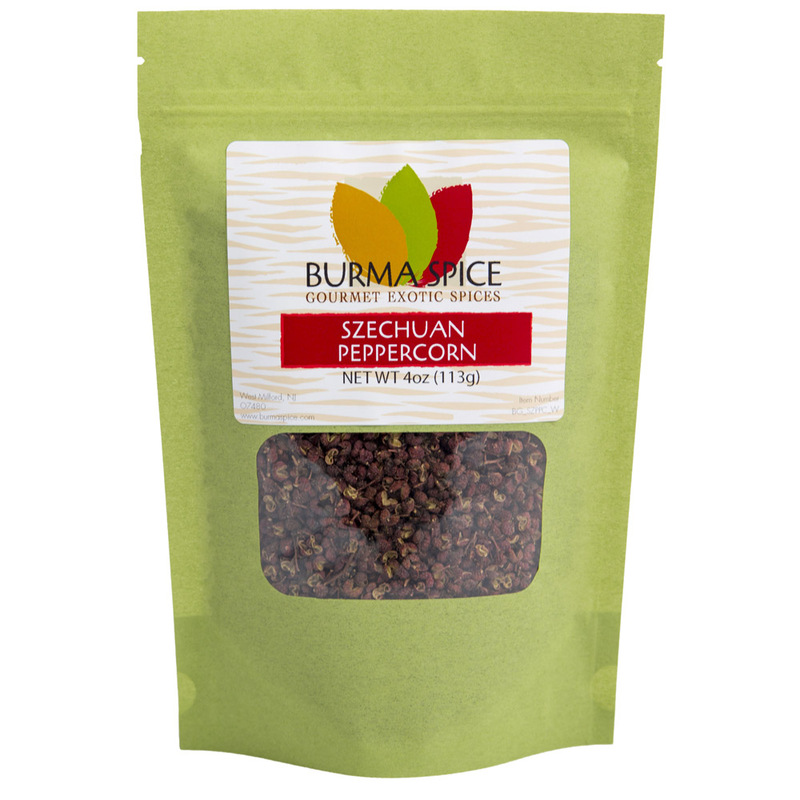 We admit that we tend to brag about our spices, and one that we’re particularly proud of is our Szechuan peppercorn. When it comes to this particular kind of pepper, there is a tremendous difference in flavor, quality, and price, and paying extra for quality is well worth it. In fact, some of our customers have told us, that because our Szechuan peppercorns are so potent, we should recommend using smaller amounts than what some recipes call for. Szechuan peppercorn is one of the five ingredients that make up the Chinese five-spice powder. They contain a unique aroma and flavor that is not hot like black or chili peppers. Instead, it contains a slight lemony taste that creates a tingly numbness sensation in the mouth, which is caused by its 3 percent of hydroxy-alpha sanshool. To preserve its potency, we suggest storing it in an airtight jar away from light. Recipes frequently call for the peppercorns to be ground and roasted. When it comes to the black seeds, you may want to discard them as they can be sand-like. When grounded and paired with salt, it can also serve as a condiment in many meat dishes. When cooking certain stir-fry noodle dishes without hot spices, Szechuan peppercorn can also be used as an oil. For instance, there are some recipes that suggest sprucing up a dish with Szechuan peppercorn oil after cooking. When people find out that szechuan peppercorn isn’t really a pepper, they are often surprised. 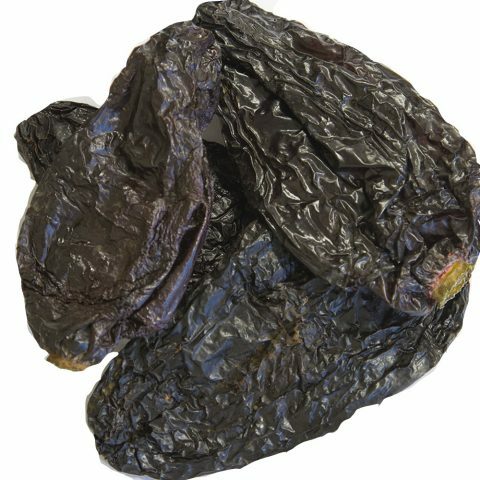 It doesn’t come from the Piper nigrum class as black peppers do, and it is not related to the Capsicum genus that chili peppers are categorized in. Instead, it is made up of the reddish-pink outer husk (the ashy shrub portion) of the genus Zanthoxylum. The name comes from the Sichuan province of northern China and is also known as flower pepper, prickly ash, and hua jiao. 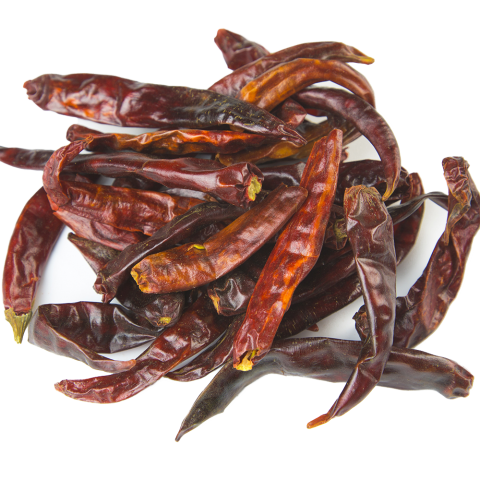 These particular peppers contain a molecule or chemical known as hydroxy-alpha sanshool. Moreover, similar to capsaicin in chili peppers, the chemical in Szechuan peppercorn interacts with nerve cell receptors known as Meissner’s corpuscles in your lips and mouth. In short, the molecule triggers the receptors and stimulates your sensory system, causing them to send a message to your brain that the area is being touched, which is why, with enough stimulation, it can feel like the area has gone numb. Lastly, from 1968 to 2004, the FDA banned Szechuan peppercorns from being imported to the United States because they carried a citrus canker that could potentially harm the foliage of many citrus crops in the U.S. It’s important to note that they never provided any harm to human consumption. The ban was lifted when the USDA and FDA found that this citrus canker could be killed when the peppercorns are heated to around 160 F before importation. Szechuan peppercorn is produced from the Zanthoxylum simulans, which is a flowering plant native to eastern China and Taiwan. It is best to plant during the spring or fall. Although they are very tolerant to the type of soil they are grown in, it is best to avoid waterlogged soil. After planting, they do require extensive watering, but without flooding the shrub roots. They do not require much pruning care. Harvesting takes place at the end of the summer and at the beginning of fall. When the reddish-pink coloring beings to show, that is when you know they are ready to be harvested. This reddish-pink hull is the actual pepper we eat, not the seed or marble. 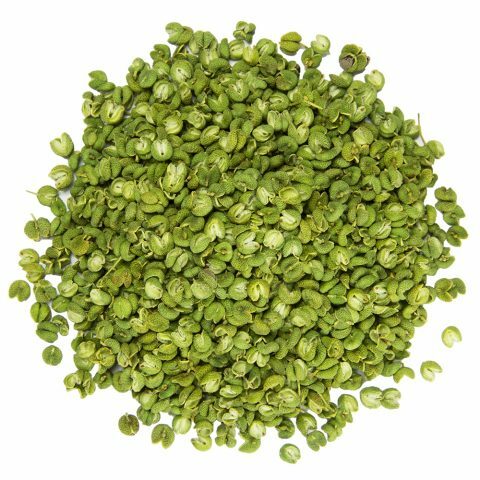 Our szechuan peppercorn is cultivated in the Shanxi province of China, which is located in the northern region. The name Shanxi means “West of the Mountains”, which is a reference to the west location of the Taihang Mountains. Shanxi is located in the inland parts of the mid-latitude zone and belongs to a temperate, continental monsoon type of climate. It has four distinct seasons with wide temperature differences between winter and summer, and large temperature differences between day and night, which makes it difficult for just about anything to grow on a seasonal basis — except for Szechuan peppercorn.